Rehab Or Die: Bathroom tiling- followup. So we finished the first floor bathroom tile. We picked up some nice looking marble at Surplus Warehouse and installed it using the very same method you will see on any DIY website/blog.TV show/DVD, etc. 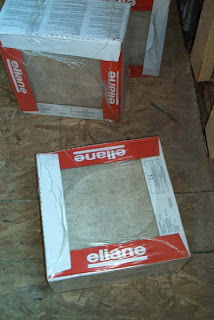 Using dry (water added) Thinset, 1/2" square notched trowel, a rented tile saw, (which we forgot to return for 2 days! Doh!) a red wax pencil (for marking darker tiles) and a measuring tape. The only thing I would suggest that we didn't do, is fully cut and layout ALL of the tiles BEFORE you mix the thinset. We laid them all out on the livingroon floor the day before, and prepared which ones would go where, but we started installing the tiles thinking that since we only had eight to cut, and they would all be straight cuts, that the following day I could start setting them in thinset, and install the last ones as they were cut. I thought we had a pretty good bead on the layout only to get stymied mid-stride by having NOT included the extra space for the threshold. This meant some additional unexpected cuts. A quick reconfigure and a good 20 minutes later, I noticed that the tiles already installed set up pretty quick with the thinset. Some of the tiles that were put in later than the first ones , turned out to be about 1/16" higher at the edges. Now probably only I will notice it, and only if I'm barefooted, but it's something to consider before you get started. The point is, if you lay them all out with the thinset in one big batch, you can level them all together and probably get a much better job. Now that we've got a better idea of how to set tile down, on our most recent trip to Home Depot we came across some cheap 12x12" tile (about $1/sq foot) and picked it up for the 3rd floor guest bathroom. Those suckers have 15 tiles in each package and they are HEAVY. We got four. They haven't made it to the third floor yet. We're working on it. 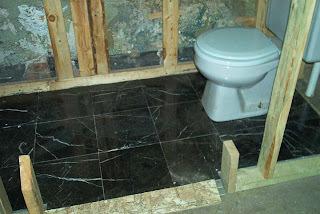 Today we screwed down the 1/4" OSB down on the second floor bathroom, and are almost ready to put the Hardibacker down. I think we'll be waiting a while before we actually get the tile down on that floor. Attention: Completely unrelated rant warning: woot woot woot. So, another long day under our toolbelts, and I apologize in advance for the crabbiness, but, both Hubby and I start work in the office at 6:45AM. In the afternoons we get to the site and work as much as we can. Then about 7 PM, we head back home to finish up more office work. We usually get to eating dinner at about 9 or 10PM, watch a Netflix, and head off to bed at about 12:30. Then we start the same routine all over again, six days a week. On the seventh, well, you know. So anyway, we sometimes find ourselves at the local grocery store rustling up some grub for dinner before heading home. Yesterday evening was one of those nights and I still had my camera in the car. We pulled into the parking spot and found the grocery cart just sitting there in the space. That peeves me in the first place because it's MY car that gets hit by the darn thing after someone ELSE leaves it there. I mean, just how much energy does one person need to expend to roll (not carry on your back or anything) but ROLL it over to the cart receptacle area where they WON'T roll out and hit anyone else's car. How lazy and obnoxious do you have to be to NOT push the cart the five feet away to the cart collection area? It was right there!!! No matter how tired we are at the end of the day, we put our carts back where they won't damage anyone else's car. I consider it a courtesy, if not an obligation. So whoever you are, lazy cart person, I hope one day you leave your cart behind in the parking space and I hope it chases you down and dings your door on your way out of the lot. 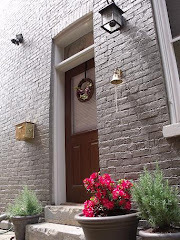 All right, so this is way, way late, but I've been reading as much of your blog as possible because I would really love to do a rehab--preferably soon, but if not soon, then someday (husband and I are looking at a candidate in a couple days). 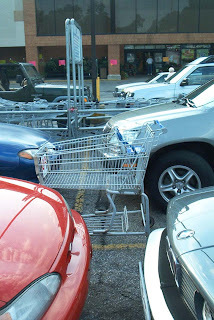 In any case, I don't usually comment on blogs, but had to when I saw your soft rant on satellite shopping carts. It is totally maddening. Thanks for all your insights on this blog! Good luck on getting/finding the rehab. Let us know if you want any advice. I can't tell if you're local, but we've got resources if you are. Don't forget to check with your city housing department. They might have something cheap-cheap. We are semi-local: Dayton area. We'll be looking at a place that (it seems; won't know better til we go) will not need anything like a complete gutting. Which is good, because, while I definitely love to learn and love to make things with my own hands, I'm not sure I'm up to that. Yet. I will definitely ask questions as they arise, and thanks for being so generous. By the way, I read you refer to this area as something like the "N. KY Riviera." I've not heard this before. What does this mean, exactly? I have a guess or two. The shores of NKY have been in a development boom for the last few years, specifically Bellevue, Dayton (KY), and Covington. I'm sure there are other reasons as well, including the history of the area: see link.